Inking It Up With Cathy: Stampin' Up! Artisans Are So Creative! Each year, Stampin' Up! has an Artisan's Award content where demonstrators submit cards, scrapbook pages and 3D items and compete for this honor. 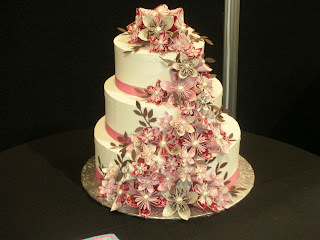 At convention last July, this cake was on display as one of the creations of an Artisan's Award recipient. I didn't note who created this but it sure shows that just about anything can be made with paper and a creative imagination!